Your contribution is vital to our mission. From honor or memorial gifts to workplace contributions, we offer many ways for you to give financially. 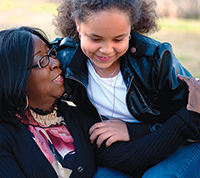 Ava, transplant recipient with her bone marrow donor, Michelle. 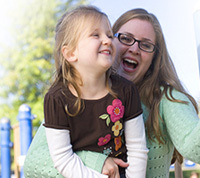 There are many ways for you to help people receive the life-saving transplant they need. 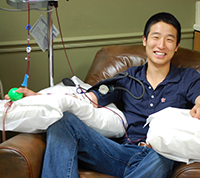 Your financial gift delivers cures to blood cancer patients. Every $100 raised adds potential marrow donors to the Be The Match Registry®, helps more patients afford transplant and funds life-saving research. 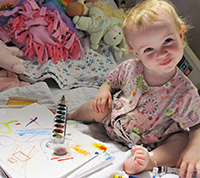 On behalf of all the people whose lives we touch, thank you for making life-saving transplants a reality. Start a monthly gift online using our secure form. All it takes is one simple action to give hope to a patient with blood cancer. Celebrate the life of a friend or loved one by making a donation in their honor or memory. Your gift can be used to recognize milestones in a blood cancer survivor’s life or to express your sense of loss when a loved one loses their battle. Without research focused exclusively on transplant science, medical breakthroughs would not be possible and patients would not receive a second chance at life. Progress has been made, but more research is needed. Our global research program makes discoveries that help patients live longer, healthier lives. Join us in our quest—dedicate your day to research. Many companies offer workplace giving programs to encourage employees to contribute to charitable organizations. We accept financial gifts from all workplace giving programs. Check with your employer to see if you can use a payroll deduction program to give a gift. Contribute through a matching gift program from your employer. Most matching gift programs will match contributions dollar for dollar, and some will even double or triple the amount of your gift! Give through Community Health Charities of America. Be The Match Foundation partners with Community Health Charities for workplace fundraising. Designate your regular payroll deductions to Be The Match during your annual workplace giving campaign. It’s a simple and easy way to give. Check to see if your company works with Community Healthcare Charities. You can also participate in the Combined Federal Campaign. Employees in the federal, civilian, postal or military workforce can designate Be The Match for pledge contributions during campaign season (September 1-December 15). Enter our designated code #10579 on your campaign pledge card. Designate your pledge to Be The Match through a workplace United Way campaign. Contact your human services department or local United Way agency for more detailed instructions about giving to Be The Match through a United Way campaign at your workplace. Employee donations are used to support member charities that provide patient services and outreach programming in local communities. For more information, contact Anna Bedard, Corporate Partnerships Operations Manager, at 763-406-8623 or abedard@nmdp.org. Have you already included Be The Match in your estate or financial plans? By informing Be The Match about your future gift, we can recognize and thank you now, and discuss your intentions for your gift to ensure your wishes are carried out. We would be honored to help ensure your gift has a lasting impact. Contact Keith Stout at 763-406-8150 or sstout@nmdp.org.